I reviewed A sky Unbroken last Tuesday, so that means a few words from Megan Crewe. In the past, I’ve also reviewed the first two books. I literally rewrite (as in, open a blank document and retype from start to finish) every book I write at least two times–once for my first personal revision pass and once for my first editorial revision pass. With some of my books I’ve done it three or four times. When I’m making substantive changes that echo through the entire book, I find it much easier to maintain consistency and stay in the flow and voice of the story that way, as opposed to editing a piece here and there in an existing document. When I mention this part of my writing process to other authors, I tend to get a lot of stares. Right now I have an almost-2-year-old, so most of my non-writing time is family time. I love reading, of course, as well as music, movies, and TV (really, any form of storytelling). I was learning kung fu for several years before my son was born and hope to return to it when I have a little more free time. And I’m an avid traveler–I get a lot of enjoyment out of immersing myself in a totally different culture or landscape. In one sentence, tell us what A Sky Unbroken is all about. Earthlings and their rebel allies fight to prevent their complete extinction on a space station controlled by a people who believe Earth is worthless. What inspired you to write the trilogy? I had a couple of different ideas that had been vaguely simmering for a while. I wanted to see more YA science fiction that wasn’t post-apocalyptic or dystopian–I enjoy those genres, and have written an apocalyptic trilogy myself, but I grew up with Star Wars and Star Trek and was eager to see characters getting right off the planet, traveling through space, encountering alien societies. So I thought I could contribute to that genre myself. I’d also had bits of a time travel idea floating around in my head–I liked the idea of seemingly innocuous details turning out to be incredibly important in solving some sort of mystery of shifts in time, and of characters having to jump from period to period trying to prevent some sort of disaster using those clues. Then I read Yo[crap]aka Amano’s illustrated story “Hero.” There’s a brief section in that story where the main character suddenly notices little changes in the world around him–his street has a slightly different name, for example–and realizes that no one else around him recognizes that anything has changed. It’s only a minor element of the story, but it stuck with me. I couldn’t help imagining how frightening and isolating that would be, and I wanted to capture that sense in a story of my own. As I developed the idea of a character who noticed small changes in our world that no one else did, I ended up connecting it to the time travel elements and then to my desire to write something more broadly science fiction-y. And the rest is history! What was one of the most surprising things you learned while writing A Sky Unbroken? I hear from readers often enough to feel appreciated, but not so often that I’m not excited when I receive fan mail! I think the two comments I hear most often are that people really connect with my main characters and that people enjoy that I take my stories in different directions than tends to be common in YA, both of which I love to hear because those are two of my primary goals with my stories. Is there a message in the trilogy that you want readers to grasp? I don’t like to come down too heavy with theme or message, but I would say the core ideas of the Earth & Sky trilogy, to me, are that it’s impossible to be perfect or perfectly control one’s life and so we’re better off making peace and working with our flaws and uncertainties, and that the variety of differences between individual people and cultures is an advantage, not a problem, that can allow us to achieve more when we come together and cooperate using our respective strengths. If you had to do it all over again, would you change anything in Earth & Sky? I would probably try to work in more information about Win’s people, because the most common complaint I’ve seen from readers is that they don’t understand their motives… until they get to THE CLOUDED SKY, where you get a much more direct demonstration of what the Kemyates are all about. It’s tricky finding the balance between confusing readers and hitting them over the head with explanations, and it seems I may have erred too far in one direction. I’ve gotten to hang out, have discussions, and do events with authors I greatly admire. Probably the most awesome of those instances was chatting with and then doing a talk with Susan Beth Pfeffer for the Rochester Teen Book Festival, because her Last Survivors trilogy was one of the main inspirations for my Fallen World trilogy. 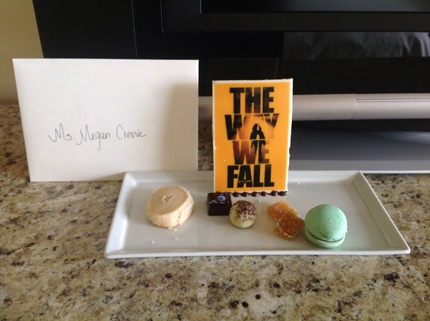 When my publisher for the Fallen World trilogy sent me to Texas for a couple of events, I went up to my hotel room and found a chocolate plaque with my book cover on it waiting for me. I have various new YA books at various stages of completion–nothing I can talk about in any detail yet, though. I’m also going to be re-releasing my debut novel, GIVE UP THE GHOST, later this year, after a while of it being out of print. Looking forward to hopefully seeing it reach new readers! Thanks for the interview, and your kind reviews! This entry was posted on Saturday, October 17th, 2015 at 06:36	and tagged with Author Interviews and posted in Reviews & Interviews. You can follow any responses to this entry through the RSS 2.0 feed.